Frozen Grand Central has a fun little video clip and collection of photos of around 200 actors working together to create a surreal experience at Grand Central in New York City. Stuff like this makes life more exciting and fun. I'm not sure if this is real, or fake, or even where it's coming from, but it's funny. An earthquake just shook our house, making it rock back and forth with loud audible groaning. At first I thought Luna was playing something in the theater really loud, because our subwoofers are technically capable of doing that, but it was too loud and lasted too long and I realized it was an earthquake. For a brief moment I thought something weird had happened just to our house, like something outside had damaged it, because I've never been in as strong an earthquake before. This is only the second one I've felt, and the first was much more mild. But there's no way an external force could have made the house move that way, unless it was trying to rock it back and forth. The cats got a little freaked out, although afterwards Kiba was still calmly sitting downstairs. He's really the bravest of them all. Luna was very scared for a short time though. She was shaking on the floor and wanted to get out of the house until I calmed her down and she could look out the window and see everything was okay and nothing was damaged. There was a lot of rocking, but only a few of the models in the display cabinet fell over near the end and they were mostly the ones that aren't very stable anyway. Nothing else fell or got dislocated, including the speakers which are wall mounted and on stands. I immediately went to the United States Geological Survey Earthquake web site and entered in my experience of the quake on their Did You Feel It? survey. This lets them gather information about who felt what when an earthquake happens, and also tells you a rough estimate of what the magnitude was. When we first went to the site, the magnitude of the quake had not yet been determined, but by the time I finished the survey (along with about 350 other people) the magnitude was recorded as 5.6. The quake was asigned ID NC40204628. Tintin lives closer to the epicenter, and she IMed me because her phone wasn't working anymore. She got pretty scared and hid under the table, and then tried calling her landlady and parents to let them know what happened but couldn't get outgoing calls to work. She said a few things got knocked over and maybe damaged, where she's staying. My phone worked fine though, and I could call her so incoming calls were no problem for her. In another case of (arguably) overreaction to terrorism fears, the Thai Cottage restaurant in Soho, UK was raided for burning chili peppers. Nam Prik Pao is a super-spicy chili dip that is made by burning the peppers, which created a strange smell. Some concerned citizens phoned it in, prompting the police to close off the street and search for the source of the smell. It must be a pretty strong smell, as one bystander reported coughing as a result, but I also suspect the restaurant would be making this dip on a regular basis. The BBC article conveniently provides the recipe so you too can be raided by your local counter-terrorist team under suspicion of being a chili pepper terrorist. This hasn't been covered by the MSM as far as I can tell, but apparently IBM is reducing the pay for some of its employees in Italy as labor union negotiations have failed. Many of the affected IBMers held a protest in SL declaring a general strike. The strike is interesting not only because it took place in SL, which has its own meaning in terms of publicity for the cause and the ability for participants to get together, but because IBM has a huge stake in SL as a corporation. IBM has tried to embrace SL, I think believing that it has an opportunity for first-mover advantages by investing time, money, and other resources in the development of that virtual world and its economy and technology. But the strike is a reminder of how the lines between RL and VR are disappearing. I came across something cool today, via Boing Boing => Pie & Hammer => MIT. It's a four-subject 1869 entrance examination. Apparently there was no real extrance examination to MIT before 1865, but the faculty started putting one together that year based on various subjects that not doubt were considered appropriate for an educated man of that time. Some of the questions are a little strange though, but I suppose interesting to know, such as the ones relating to geography. I was bored so I took the Nerd Test 2.0 and rated Uber Cool High Nerd. Sony has a pretty poor reputation for choosing (arguably) racist, blasphemous, or other questionable advertisement images. But there is one campaign that Sony has done exceptionally well: the Bravia: Color Like No Other live-art advertisements. 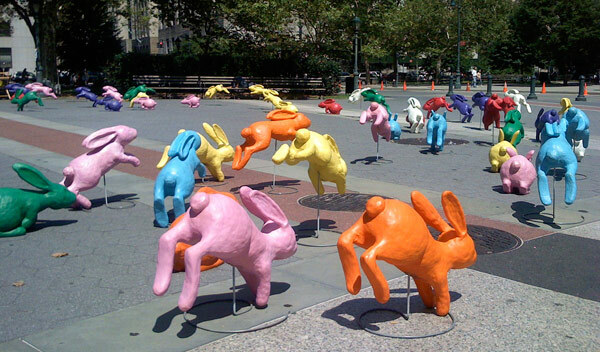 The first in the series was the Bouncy Balls in San Francisco, then the Paint Explosion, and now comes the Bunnies in New York City. I love it. :D Check out more photos at Gizmodo and from a couple of Flickr sets: bravia-ad and Sony Bravia. I came across an interesting brain teaser about cognitive science titled When Brain Damage Helps. Apparently, a 2005 study concluded that problems involving insight could be more quickly and easily solved by patients who had suffered damage to their lateral frontal cortex. There are some differences between the simple test on this web page and the testing that was done in the study, of course, but it's still an interesting experiment. So I was able to solve the first problem on the web page fairly quickly. And then I solved the second problem in about 10-15 seconds. It took one of my other coworkers about a minute to figure out the second one, and another one of my coworkers didn't come to the right answer. I guess I need to get my lateral frontal cortex checked out now. The LARPers of Mordavia built what has to be the most impressive LARPing costume ever: a stone golem. Too excellent. Total coolness of Osaka does Ellen Feiss. For those who aren't aware, this is the original commercial that aired as part of Apple's switch campaign. Seems a Japanese TV show had a contest for the most amazing Rube Goldberg machine. The result in this video is a 6 and 1/2 minute machine that ends up making a bowl of hot ramen with egg. Crazy. In a wonderful turn of events, a group of teenage girls who decided to have some fun (think performance art) built some really good question-mark blocks from the game Super Mario Bros. and left them around town. Residents of the town got crazy and assumed they were bombs or other evil items. So now the girls seem to be facing criminal charges. Seems as though Chevrolet has put together some sort of advertisment-creation contest for their new Chevy Tahoe SUV. Clever interactive marketing ploy, with television show tie-in? Or incredibly stupid marketing idea because of viral videos? I think the latter. Tintin told me about this personality test site called PersonalDNA. It actually has nothing to do with DNA, and it also makes you describe yourself, instead of asking you questions that will let it figure out how you should really be described. In other words, it's going to tell you exactly what you tell it. Not very smart. Anyway, my "personal report" is available for people to view. Nothing new in here, which makes sense because it's reporting exactly what I told it. Anyway, my label is Considerate Idealist. Here's the 2D image map that is supposed to represent my personality. There's supposedly a more interactive one which you can view on the report itself, but it didn't do anything interactive when I tried. I prefer the horizontal representation, but that only provides information in one dimension. So I'm linking to the tiled representation. Owen Linzmayer has released a portion of his book, The Mac Bathroom Reader, for public consumption on Curt's Media web site. The excerpt is titled The 1984 Apple Commercial: The Making of a Legend. For those who are unfamiliar with this commercial, it is the most successful and most popular television advertisement of all time, and won dozens of awards. A baby born in India over the weekend was born with her heart outside of her body, located between her neck and collar bone. A doctor is quoted as saying, "She was holding her heart in her right hand when born.". Unfortunately, the baby's parents are too poor to afford surgery, so although the doctors managed to remove her hand from the heart, she died from an infection. As a lesson, whenever setting up four million dominos, keep the windows closed to prevent birds from flying in and knocking them down. Likewise, birds take note that if you knock down four million dominos, humans will shoot you dead as you quake in fear trapped in the corner of a room. The Korea Herald is reporting on an eight-year-old boy named Song Yoo-geun. Interestingly, he has just been accepted into the Physics department of Inha University, after taking tests to pass out of elementary, junior-high, and high school. In other words, he's the world's youngest genius. An Open Letter to the Citizens of the U.S.A. The following is an open letter to the citizens of the United States of American from John Cleese. In light of your failure to elect a competent President of the USA and thus to govern yourselves, we hereby give notice of the revocation of your independence, effective immediately. Her Sovereign Majesty Queen Elizabeth II will resume monarchical duties over all states, commonwealths and territories (excepting Kansas, which She does not fancy). Your new prime minister, Tony Blair, will appoint a governor for America without the need for further elections. To aid in the transition to a British Crown Dependency, the following rules are introduced with immediate effect: You should look up "revocation" in the Oxford English Dictionary. 2. The letter 'U' will be reinstated in words such as 'favour' and 'neighbour.' Likewise, you will learn to spell 'doughnut' without skipping half the letters, and the suffix ize will be replaced by the suffix ise. 3. Using the same twenty-seven words interspersed with filler noises such as "like" and "you know" is an unacceptable and inefficient form of communication. There is no such thing as American English. We will let Microsoft know on your behalf. The Microsoft spell-checker will be adjusted to take account of the reinstated letter 'u' and the elimination of -ize. You will relearn your original national anthem, God Save The Queen. 5. You will learn to resolve personal issues without using guns, lawyers or therapists. The fact that you need so many lawyers and therapists shows that you're not adult enough to be independent. Guns should only be handled by adults. If you're not adult enough to sort things out without suing someone or speaking to a therapist then you're not grown up enough to handle a gun. 7. All American cars are hereby banned. They are crap and this is for your own good. When we show you German cars, you will understand what we mean. 8. All intersections will be replaced with roundabouts, and you will start driving on the left with immediate effect. At the same time, you will go metric with immediate effect and without the benefit of conversion tables. 9. The Former USA will adopt UK prices on petrol (which you have been calling gasoline) roughly $6/US gallon. Get used to it. 10. You will learn to make real chips. Those things you call French fries are not real chips, and those things you insist on calling potato chips are properly called crisps. Real chips are thick cut, fried in animal fat, and dressed not with catsup but with vinegar. 11. The cold tasteless stuff you insist on calling beer is not actually beer at all. Henceforth, only proper British Bitter will be referred to as beer, and European brews of known and accepted provenance will be referred to as Lager. American brands will be referred to as Near-Frozen Gnat's Urine, so that all can be sold without risk of further confusion. 12. Hollywood will be required occasionally to cast English actors as good guys. Hollywood will also be required to cast English actors to play English characters. Watching Andie MacDowell attempt English dialogue in Four Weddings and a Funeral was an experience akin to having one's ears removed with a cheese grater. 13. You will cease playing American football. There is only one kind of proper football; you call it soccer. Those of you brave enough will, in time, be allowed to play rugby (which has some similarities to American football, but does not involve stopping for a rest every twenty seconds or wearing full kevlar body armour like a bunch of nancies). 14. Further, you will stop playing baseball. It is not reasonable to host an event called the World Series for a game which is not played outside of America. Since only 21% of you are aware that there is a world beyond your borders, your error is understandable. 15. You must tell us who killed JFK. It's been driving us mad. 16. An internal revenue agent (i.e. tax collector) from Her Majesty's Government will be with you shortly to ensure the acquisition of all monies due (backdated to 1776). 17. Daily Tea Time begins promptly at 4 PM with proper cups, never mugs, with high quality biscuits (cookies) and cakes; strawberries in season. Super Size Me is a documentary about one pretty healthy guy deciding to find out what would happen to his body if he ate McDonald's, and only McDonald's, for thirty days. Three meals a day, and the only thing he can eat must be something he can purchase from McDonald's. This is a very popular documentary because it is a human experiment that produces dramatic results. The short summary is that the subject, Morgan Spurlock, quickly enters an unhealthy state, and just as quickly a life-threatening state. There are several great things about this documentary. The first is the subject: fast food and America's growing obesity problem. This is something that became very hot in the last few years, and resulted in a lawsuit against McDonald's for supposedly producing extremely unhealthy food, marketed to the public and young children with a tendency towards unhealthy consumption. The second is that this is a real human experiment. This isn't a bunch of people talking about scientific research or theorizing about cause and effect. Morgan tries it out for himself, and keeps track of what's happening to his body by bringing doctors and nutritionists into play. Of course, a lot of content is provided by "experts" and other important people involved in this scene, as any documentary has. But probably the greatest part of the documentary is that it isn't boring. It is completely non-boring at all times. It's funny, wacky, entertaining, informative, engaging, and all of this at the same time throughout the film. This is partly due to great editing and post-production, but also due to the comedic view Morgan has about this whole topic. Apparently an 11-year-old girl is having her photo going around the Internet with messages asking for lessened Chinese hostility towards Japan. I don't really know how this started, or if it is even with this girl's permission, and maybe it is a hoax. Very strange how this happened. Anyway, here's a little more info about what is going. I took this test a while ago, but decided I might as well post it now. On the Religion Selector, I scored as 100% secular humanist. Read on for a description. Belief in Deity: Not considered important. Most Humanists are atheists or agnostics. Origins of universe/life: The scientific method is most respected as the means for revealing the mysteries of the origins of the universe and life. After death: An afterlife or spiritual existence after death is not recognized. Why evil? No concept of “evil.” Reasons for wrongdoing are explored through scientific methods, e.g. through study of sociology, psychology, criminology, etc. Salvation: No concept of afterlife or spiritual liberation or salvation. Realizing ones personal potential and working for the betterment of humanity through ethical consciousness and social works are considered paramount, but from a naturalistic rather than supernatural standpoint. Undeserved suffering: No spiritual reasons, but rather a matter of human vulnerability to misfortune, illness, and victimization. Contemporary Issues: The American Humanist Association endorses elective abortion. Other contemporary views include working for equality for homosexuals, gender equality, a secular approach to divorce and remarriage, working to end poverty, promoting peace and non-violence, and environmental protection. I took The Azumanga Daioh Character Quiz and I am Sakaki! You are Sakaki-san! I want to meet you. In fact, everyone does. You're the coolest person out there. You are just inherently cool. But... you wish you weren't. You'd give it all up for being cute. Really really cute. You become obsessed by things and focus on them 100% of the time... and never with any results. You get easily embarrased and are very shy. You rarely feel comfortable in your own body. You try to protect your friends, and you always win whatever you do... without even trying. You'd like to be good with animals, but they ussually just use you... and sometimes abuse you. But they are the most important things in the world, along with cuteness and emotions. You tend to try to hide your inner shyness with a mask of indifference, but really, there's nothing to hide. You are just really cool. Your best friend would be a Kagura, and you should defenitely go into whatever field suits you best. You are good at everything, so just do what you love doing! So, I ran across a posting on MacSlash about a review of the new Mac mini. This review is entitled Mac Mini: The Empreror's New Computer and is written by someone named Jorge Lopez. At the bottom of the article, it states: "Jorge Lopez is a DeVry graduate with an MCSE certification and is currently the Chief Software Reviewer at Divisiontwo.com's Technology Insider." If this review is indicative of the people produced by DeVry, I think that's going to be an automatic fail on any resume I see. If you take a closer look, of course, it becomes clear that DivisionTwo is running a huge joke site. Either that or it is composed of the stupidest people in the world. I'm pretty sure it's a joke site. The articles are not clearly jokes though. If you visit The Onion the articles are clearly fake because the subjects are stupid. Of course, there have been reports of people believing The Onion. Newton Stuck a Needle in His Eye? This is weird. (And it has forced me to make a new category named as such.) Apparently one of the experiments conducted by Sir Isaac Newton was to stick a needle in his own eye. He then wrote down his observations (I see a big metal dot) and took notes on the experience. Maybe someone will stick a needle in their ear and write down what they hear.